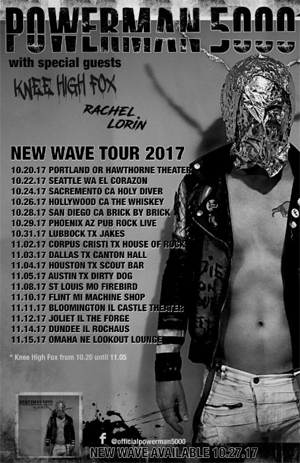 In support of the upcoming album, New Wave, POWERMAN 5000 announces the first leg of a worldwide tour that will last through the end of 2018. The band will first hit the West Coast, hosting their record release party on October 26, 2017, at the world famous Whisky A Go Go. Afterward, come visit the POWERMAN 5000 booth at LA Comic Con. The convention takes place from October 27-29, 2017, at the LA Convention Center. New Wave hits the shelves of all digital and retail outlets everywhere on October 27, 2017.